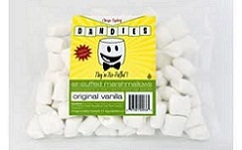 Dandies specializes in vegan marshmallows. See 167+ Dandies Reviews and save an extra 10% on Dandies with Coupon Code* YAG250 at iherb.com/Dandies?rcode=YAG250. Nutrition: Serving 28 g, Calories 90, Fat 0 g, Carbs 22 g g, Fiber 0 g, Sugars 20 g, Protein 0 g.
Ingredients: Corn syrup, vegan beet sugar, corn starch, corn dextrose, water, carrageenan, soy protein, natural vanilla flavor, titanium dioxide (natural mineral). Contains: soy. Gluten free Made on dedicated vegan equipment in a peanut/tree-nut free facility.